Shoppie the chicken lives in her own, happy poultry world. It’s no secret that critters on Rusty Metal Farm live to a ripe old age. A few weeks ago I wrote of Reggie, the elderly cat I adopted as a rescue and who, despite all medical diagnosis to the contrary, seems determined to squeeze as much out of what looked to be his ninth and final life as possible. While I am retired from mushing, there do remain several sled dogs on the farm enjoying life in a massive, fenced-in yard and are quite active given their advanced ages. 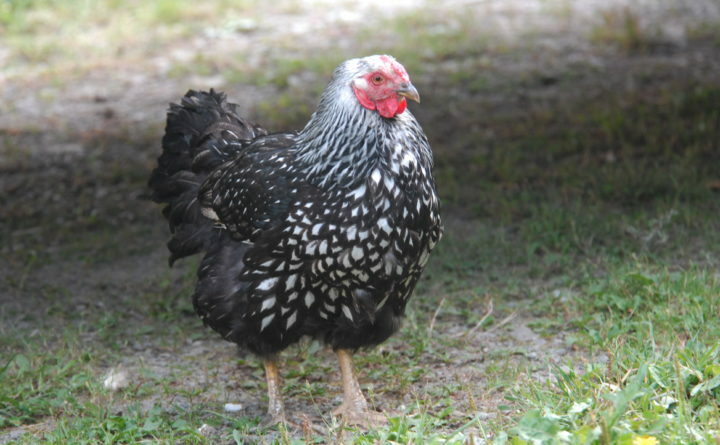 Shoppie is a silver Wyandotte, a popular show bird and good egg producer, who sports beautiful black and silver plumage. She was purchased during a phase in which I admit to selecting chicks based more on photographs of how they would look as adults instead of how many eggs they would produce. She came early to the Rusty Metal life, maybe just the second or third year I was raising hens, which puts her age around 8 or 9. That was back when I still believed poultry to be devoid of anything resembling individual personalities. I mean, come on, we are talking about birds with brain pans the size of peas, right? Not only have my laying hens shown distinct idiosyncrasies over the years, but some also have displayed analytical thinking prowess, and a few have outright outsmarted me. Yeah, I’m not exactly proud of that last point. That aside, even in a flock of strong personalities, Shoppie stands out. First of all, it’s rare for me to name my gals beyond granting nicknames based on breed, color or how annoyed I am with them at any given moment. So, there’s White Chicken, Black Chicken, Araucana, Buff, The Comet — you get the idea and no, I never claimed to be original. Shoppie earned her name about five years ago when she became quite ill after inadvertently getting locked outside the coop one night and the temperatures plummeted to below zero. For a chicken, getting chilled is very bad, as they are unable to effectively regulate their temperatures enough to warm up when cold. I found Shoppie looking near death the next morning and honestly believed she was not long for this world. So, I scooped her up, brought her inside and made a fluffy bed for her in a box and placed in near the wood stove, so she could at least spend what little time she had left in heated comfort. Poultry palliative care, if you will. When I checked on her a few hours later, she was still unconscious but breathing. Seeing no reason she should go hungry or thirsty while shedding her mortal feathered coil, I warmed some water and mixed in vitamins and electrolytes I had on hand for sled dog medical emergencies. Gently placing the dish under her beak I waited to see if she’d notice. I even made “yum yum” noises to encourage her. And I’ll be darned if she didn’t crack one of her beady black eyes, look at me and drink a bit. She spent the next week or so in the basement in her fluffy bed growing stronger on a diet of electrolyte and vitamin infused water, canned cat food, and antibiotics. Once she was strong enough, I moved her into a bigger recovery cage. In the heated shop where she seemed perfectly content to relax and recuperate. After she’d spent about three weeks there, I began calling her Shoppie, thinking she’d be a sort of shop mascot. But the day she came at me full-on when I opened the cage door to feed her, squawking and flapping her wings, I knew she was ready to rejoin the flock. Now she’s the elder matron, years past her egg laying days, and has become somewhat, well, somewhat special. She seems to operate a step or two behind all the other chickens. In the morning when I let them out to range, it takes Shoppie awhile to notice the coop door is open, and that her buddies have all gone outside to nibble on fresh grass, bugs and grubs. Eventually, she sort of wanders out, blinks, looks around and ambles out into the yard. Sometimes she joins the others in pecking or a dust bath. Other times she just sorts of stands, lost in her own little fowl world and staring off into the distance. When I toss treats to the flock, every one of the hens sprints to grab a goodie. Not Shoppie. She just stands, bewildered by all the activity. Even if a treat lands at her feet, she really is not sure how to proceed. The other day I spotted her standing alone in the yard when all of a sudden she began to slowly flap her wings and begin turning around and around in place. A chicken interpretive dance? I honestly have no idea what she was doing or thinking. Frankly, I doubt she did either. The rest of flock actually seems to keep an eye on her. Her two BFFFs [best feathered friends forever] are White Chicken and Araucana. White Chicken is never all that far from Shoppie as she wanders around, and if something seems to be threatening Shoppie, it’s Araucana who comes running to her defense. Shoppie has not laid an egg in years and as the months go by, her feathers look more and more bedraggled. At some point in the past couple of years she stopped “scratching” on the ground enough to keep her toenails from growing. So, yeah, now I give her poultry pedicures when those nails grow too long. I have no idea how long Shoppie will hang in there, but every indication points to a long life in her own little chicken world.